Oh very nice! I just watched this movie on Blu-ray the other day. Classic. They do seem to be. I grew up watching it on VHS so the Blu-ray looks and sounds really impressive in comparison. Good to have you back, John! “Forbidden Planet” is one of those rare films that hold up as well today as it did when it was released, and it’s one of my all-time favorites. Everything about it works; from the production and costume design to the acting to the special effects, it all fits together perfectly. 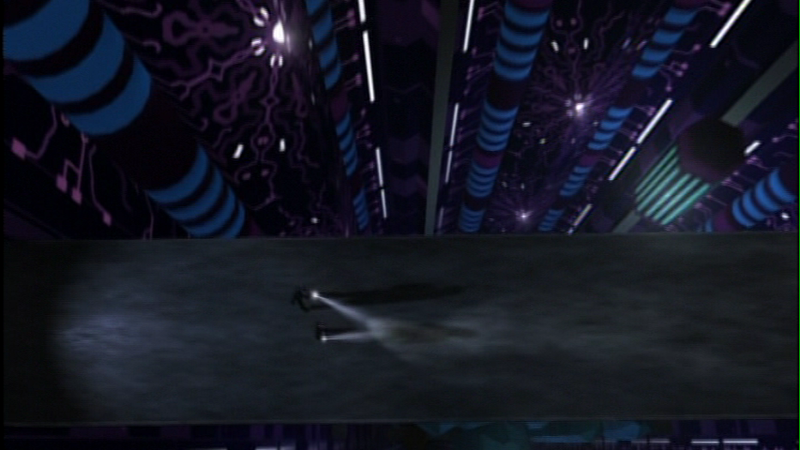 The forced perspective, miniature, and matte shots inside the huge Krell complex are astounding as is the animation of the Id monster during the forcefield battle scene. And we can’t forget Robbie the Robot. He’s the face of this movie (as evidenced by the movie poster above) and he stands alongside C-3PO and R2-D2 as one of the most recognizable robots in the history of film. Plain and simple: I love this movie! There was talk a few years ago that there was to be a remake of this film, but I hope it never comes to pass. If the lackluster update of “The Day the Earth Sttod Still” taught us anything it’s that some classic films don’t need to be redone. They should be left alone. Nice to be back too, Thanks, I completely concur with you about everything you said and I was actually on the remake for a while, Erwin Kershner was going to direct it and Stan Winston’s group was going to do all the creature and robot work. 4 pages into the script though the disaster began and by the 10th page it would truly have been an unforgivable sin to continue. Blasphemous and a horrible retelling of this story was in the works and We were all glad when it went down!!! Yes LEAVE IT ALONE!!! I am a little worried about this remake of “The Thing” “OZ” and the “Alien” Prequel, So far the only movie that was remade that stands true to the Original and I think in many ways better, is the Coen Brother’s “True Grit” that came out around Christmas time!!! I think the difference here is that the Coen Brothers did not try to remake the John Wayne version of “True Grit” they went back to the original book and made a new version of that. And L. Fran Baum who wrote the OZ stories made several movies in the early 1900’s and there were people who thought the ’39 version was a remake. But with Forbidden Planet, it was a milestone film, it, like Star Trek, showed a realism that was lacking in Sci Fi at the time. Really the only bad thing I would say is that unlike Trek, it does not show a diversity in its crew. I have seen it many times over the years and it never gets old. Really, I didn’t know that about the OZ stories. Yes I loved that the Coen’s used the book as their starting point, and when i heard it was Ethan and Joel behind this project I had to stand up and jump for joy!!! No one else could have pulled True Grit off as perfectly as the Coen’s did! The new “The Thing” movie is a prequel that shows what happened at the Norwegian base camp. It seems the people doing it are giving it their best, so lets hope it is a decent film. John, you were going to work on the FP remake? I’d LOVE to see some of your designs for it, if you even got to that stage, that is. Hard to believe it seemed to be such a train wreck, especially with the people involved. Then again, just because you have good people working on it doesn’t mean you’ll get a good movie at the end. I’m not too concerned about the prequel to “The Thing.” The stuff I’ve seen and read so far really makes it seem like they’re trying to keep the new film in line with John Carpenter’s version, so I’m keeping an open mind. The “Oz” remake/sequel/prequel/reboot/whatever isn’t my sort of thing so I haven’t given it much thought. The “Alien” project seems to have everyone confused at the moment. Ridley Scott has said that the film isn’t really a prequel, but an original story containing elements that could fit in with the “Alien” franchise; including (apparently) the revelation of what happened to the gigantic “space jockey” seen in the first film. Any other facts about the film are being held under tight lock-and-key so we’ll just have to wait until it openes to find out. And yes, “True Grit” was an astounding film! The original is a favorite, so I was a bit worried when I heard about the new movie. I shouldn’t have been, though. The Coen Brothers knocked another one out of the park. They got it right and their version of “True Grit” has it’s own soul. I can’t recommend it highly enough. I love this movie a ture classic. If 2001 a space odyssey, is the father of the moden sci-fi movie, then this is the Grandfather. The one thing that I always love about this movie, is that we are in a flying saucer and not the bog standard Rocket ship that you saw before this and after. I need to pick this up on Bluray. My daughter who is 4, is also a budding sci-fi fan would love this film. Her current favoirte film is AVATAR the director edtion. It amazed that she can sit though all 3 hour of that without getting board. WOW I am so glad for you Sci Fi dad!!! not many of the kids today get into this fantastic realm of wonder… I haven’t seen Avatar yet but hope to soon..
You’ll love it, even if it is Dance with wolfs in Space and Pocahontas. I love this movie. I think it is the first time that a vision of the future was credibly depicted on the big screen. Forbidden Planet set countless standards (plot-wise and visually) that are still valid today. It was way ahead of it’s time and it is amazing how many standards were set in this one. Alex says hello. As you can imagine he’s been a fan of this movie since about age 4. Now at the ripe old age of 7 he’s thinking of tackling Polar Lights C57d cruiser. I am into SciFi because of this film. I remember, as a kid, seeing this on TV and was amazed. It was serious, it was about who we are and what we can become (for better or worse). And most of all, it did it all in a thoroughly entertaining way. I recommend this to people all the time. They are amazed at how a (as of now) 55 year old film can hold up to it’s contemporaries. I just watched 2001 this weekend, a 43 year old film!, and was thinking how old some of these classics are. I totally love Robby the Robot! Thanks for sharing those images and nice to hear from you again! Robby is the best!!! I haven’t seen 2001 in many many years and so need to see it again. OH Yeah Asner would have been so cool!!! and thanks for the title correction, HAAAA! John what a great post! Forbidden Planet still holds up well today, as far as story, characters and production and I will put thier 1950’s effects up against CGI any day. Indeed, I love the opening when the Saucer is approaching camera and you see the little dissolve from the animated saucer to the miniature for the fly over. I rewatched it over the summer via Netflix Streaming. The whole series is available. My boyfriend and I took the opportunity to show one of our younger friends this movie for the first time tonight. He was in complete disbelief that it was made in 1956! Finally he got to see something that I first experienced as a little girl and something that’s shaped my tastes in sci-fi, adventure, and entertainment in general. He came away quite impressed by the classic film. It was great to see it again and even greater to get to share it with someone who became a new fan! How cool and it is a treat to see these old favorites with new viewers!!! How fun also to see how many friends here are all inspired by the same things!!! I hope you enjoyed it, sir. The USS Tempest was created by a young gentleman name Bill. He uses a nickname in the 3D Daz community forum, known as “Redfern”. Please give credit is due to “Redfern”. Mr. Dexler has already seen the USS Tempest when I send the USS Tempest on Facebook. He like it. Very starfleet style. Cool n thanks for sharing!!! Cool pics from one of my all-time favorite flicks! Thanks, John! Hope things are going well for you and the fam! Thanks and all is good, we are contemplating a big move from dingy California to beautiful Wyoming at the moment!!! Holy shamolly! Back up for some air! I’m ashamed to admit that I haven’t seen this one yet! :: quickly adds it to the list of movies to watch :: Thanks for the reminder of it, John! Simply said, without the imagery and innovation of Forbidden Planet, there would be no Star Trek. Um, being made in 1956, would make it the 65th anniversary. Amazing movie. A true classic that is always a pleasure to watch. sorry buddy you have to do your math again. You are absolutely correct. Must have let my ID do the math. HAAA! You made go back and count the years a couple of times to make sure I had it right!!! Those bloody ID”S!!!! …that, and the 60 gallons of whiskey.